Costa Rica has refused to recognize Maduro’s new term as president of Venezuela and is supporting Juan Guaidó. Because of this, the Chargé d’Affaires, Danilo González, had to leave Venezuela and return home to Costa Rica following a note of protest and diplomatic threat. He will soon go back to the capital of the South American country. This will happen in the next weeks. His return to Caracas will be under different conditions since President Carlos Alvarado recognized Guaidó as the legitimate leader on January 23. González’s official work in the country will formally begin soon. His last two visits were “extraordinary” in which he went to address specific issues such as management of the embassy and aspects related to diplomatic accreditation as well as to be there when the presidential transition took place in case there were any issues with Costa Rican in Venezuela. Costa Rica has not had a ambassador in Venezuela since 2015. 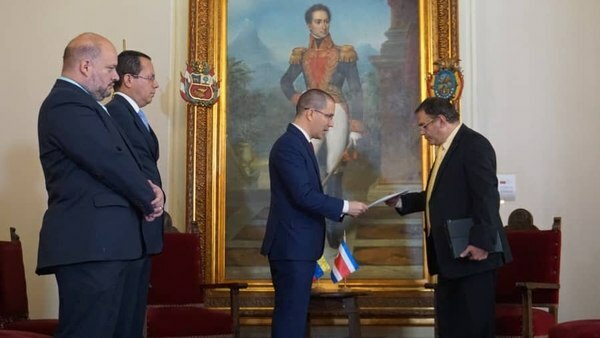 Guaidó, however, stated the need for diplomatic delegations in the country.